One of the most popular country bands of the past two decades is back! Lonestar announced that the band reunited with the original lead singer Richie McDonald to celebrate their 20th anniversary. 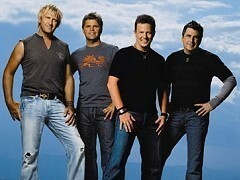 Not only is Lonestar and Richie going to tour in 2012, but they will also get back in studio to record a brand new album! Lonestar has been one of the most successful country bands and their million selling crossover hit "Amazed" ruled the charts worldwide. When the record sales started declining, frontman Richie McDonald left the band, but his efforts as a solo artist gained limited attention. In the meantime Lonestar hired Cody Collins to sing lead, recorded two solid albums and made their party heard around the world on several worldwide tours, including an impressive show in Interlaken, Switzerland, where I got to interview them. Richie's return might get Lonestar back on charts as well as increase the sales again. There's nothing but bright future ahead of Lonestar. One of the very first shows with Richie McDonald will be performances and the International Festival of Country Music in London (UK), Belfast (UK), Zurich (Switzerland) and Mannheim (Germany).